Building a new home is likely to be one of the largest purchases you will ever make. It should also be one of the best life experiences you will ever have. Select the right builder and you’ll enjoy many happy days building your home and living in it. But choosing the wrong builder can be stressful, heartbreaking and costly. Here are seven key questions that will help you decide if a builder is the right fit for you. 1. Do they have the necessary skills and experience to undertake your project? Look for a builder with a proven track record for building the type of home you want to build. 2. Is the builder registered and do they hold the correct insurances? This information is readily available online to prospective home builders and is worth checking. Give us a call and we can explain anything you don’t understand about builder registration or insurance. Insurance and liability may seem complicated but they are the only way to make sure you’re covered. 3. Do they regularly work in the area in which you propose to build? Having a builder who knows the area and has experience building there means that key elements like getting approvals and meeting regulations will have already been handled by them before. You don’t want your building project to be a fact-finding mission for your builder. If they’ve built in the area before they probably already know the correct answers and best order for every building stage. Knowing your builder is active in your area will also increase the likelihood of support after handover. 4. How many properties do they currently have under construction? This will vary with each builder depending on the size of their company and the segment of the market they are looking to service. 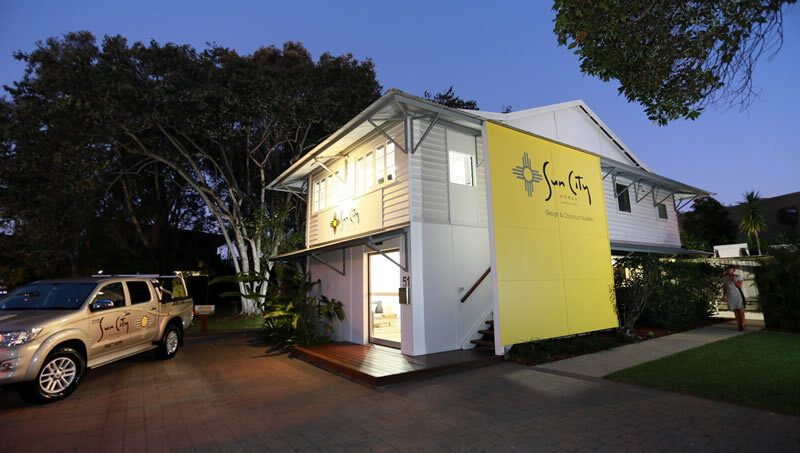 For example, at Suncity Homes, in order to maintain the consistent high quality of our work, we have Ben our construction manager oversee each detail of every house we build. We have seen the inconsistencies and miscommunication issues involved where multiple supervisors are involved on varying jobs at different stages. Even with support from Diane, registered builder and Suncity Homes owner, there has been a conscious decision to only take on a comfortably managed number of projects each year – usually no more than ten homes depending on their scale. This enables us to make sure every client’s home gets attended to with prompt individual attention. We never take on more homes than we can build to the highest standards because our focus is on quality not quantity. 5. How long have they been in business and have they ever been declared bankrupt? Be wary of new builders or new building companies that may have been set up by people who have made mistakes in the past. Unfortunately, bankruptcy is common in the building industry and remains costly and distressing for home builders. 6. How are communication and site visits managed during construction? Everyone has their preferred means of communication. Some things such as site visits with architects and builders should take place in person. Other times, phone calls or emails will suffice. Find out who is the main person you will communicate with and ask how often they will contact you. Learn who will be making site visits and how you will be informed on progress if you won’t be present at those. 7. Do I have any allowances in my contract? We recommend you get a detailed quote and final costing which means you know exactly how much your home build will cost. If your quote isn’t comprehensive (minimum of say 10 pages), be aware that price increases are likely during the build. Make sure you have an understanding of terms such as PC and PS allowances and how they can impact on your budget. Any builder should be happy to make time to provide answers to these questions. Only then you can decide which builder is best for you. To ask us these, or any other building questions, call Andrew now on (07) 5447 1699 or use our quick online contact form.